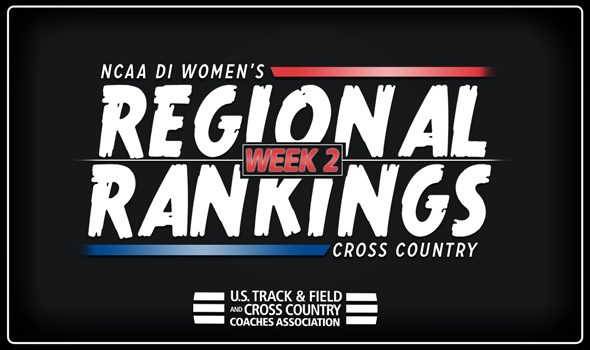 NEW ORLEANS – While the cross country season is still kicking into gear, there wasn’t much movement in Week Two of the U.S. Track & Field and Cross Country Coaches Association (USTFCCCA) NCAA Division I Women’s Regional Rankings that were released on Monday. Only eight of the 45 teams in the top-five of the regions of the poll had any movement although a new No. 1 was crowned in the Mid-Atlantic Region. See below for more information on who took the top spot in the Mid-Atlantic along with the complete rankings including overviews of each region as well as the full top-15 lists of each region at the bottom of the post. The top-two teams in each region automatically advance to the NCAA Division I Cross Country Championships. The top-five teams in the Great Lakes region remained the same for the third consecutive poll to open the year. No. 1 Wisconsin stayed in the top spot and was followed by No. 2 Michigan, No. 3 Michigan State, No. 4 Indiana and No. 5 Notre Dame. Alicia Monson led the Badgers to an opening-season win at the Badger Classic, Hannah Meier did the same for the Wolverines at the Greeno/Dirksen Invitational, Erin McDonald led the Spartans to a victory at the Spartan Invitational, Katherine Receveur helped the Hoosiers collect a win at the Meet of Champions and Annie Heff was the drive behind the Irishs’ National Catholic Invitational win. Wisconsin, Michigan, Indiana and Notre Dame will battle it out at Pre-Nationals on October 13 while Wisconsin and Indiana will be at the Nuttycombe Invitational on September 28. There is a new No. 1 in the Mid-Atlantic Region as Villanova has taken the top spot after a victory to open the year at the Main Line Invitational this past weekend. Graduate transfer Caroline Alcorta won the individual title at the meet. Falling one to No. 2 is Penn State who was off from competition. Georgetown remained at No. 3 while No. 4 Princeton and No. 5 Penn flipped-flopped from their positions in the previous poll. The two Ivy League schools went head-to-head at the Harvard-Yale-Princeton meet with the Tigers collecting the team victory. Villanova, Penn State, Georgetown and Penn will all take to the course for the Nuttycombe Invitational on September 28. The Midwest Region didn’t have any changes in the top-five as No. 1 Iowa State, No. 2 Minnesota, No. 3 Oklahoma State, No. 4 South Dakota and No. 5 Northwestern all remained in their previous spots from the last regional poll. South Dakota took second to No. 12 Michigan at the Woody Greeno Invitational while Northwestern finished second overall at the Badger Classic. Iowa State, Minnesota and Oklahoma State did not race this past weekend. The Cyclones, Gophers and Wildcats will all meet at Pre-Nationals on October 13. The defending NCAA Champions in New Mexico remained in the No.1 spot in the Mountain Region for the third-straight week to open the season. No. 2 was held by Colorado while there was a switch in the third and fourth spots. BYU improved one to No. 3 while Utah State fell one to No. 4. Coming in at No. 5 was Colorado State. For the most part the top teams in this region still have yet to run their top squads in competition, which is expected to happen in the next few weeks. The current top-five will all be competing at Pre-Nationals on October 13. New Mexico, Colorado and Colorado State will also meet at the Nuttycombe Invitational on September 28. No. 1 Providence, No. 2 Syracuse and No. 3 Dartmouth all remained atop the Northeast Region but there was change in the bottom half of the top-five. After finishing second at the Iona Meet of Champions (with the same 30-point total as Indiana), Columbia improved top spots to enter the top-five for the first time this season at No. 4 in the region. Yale held firm at No. 5 after a second-place showing at the Harvard-Yale-Princeton meet while Cornell was bumped two spots to No. 6 despite winning the Buffalo Stampede. The top-five teams won’t see each other much during the regular season with just Syracuse and Yale meeting at Pre-Nationals. There was no movement in the top-five of the South Region as No. 1 Georgia, No. 2 Florida State, No. 3 Georgia Tech, No. 4 Mississippi State and No. 5 Tennessee all held in their spots from the previous poll. The Seminoles and the Bulldogs of Mississippi State each picked up a victory this past weekend with Florida State winning the ACC Dry Run and Mississippi State taking home the Falcon Classic title. Georgia, Georgia Tech and Tennessee were all off. Georgia, Florida State and Tennessee will link up at Pre-Nationals on October 13. The South Central Region remained the same at the top like the majority of regions in this week’s poll. Four of the five teams were off this week with only No. 3 SMU taking to the course for action. The Mustangs won the Ken Garland Invite with a 19-point performance, led by individual champion Hannah Miller. The Razorbacks, Longhorns and Horned Frogs will duke it out at Wisconsin’s Nuttycombe Invitational on September 28. There wasn’t much movement in the Southeast as the region was forced to cancel numerous meets due to Hurricane Florence impacting the area. The top-five teams, No. 1 NC State, No. 2 Furman, No. 3 Virginia Tech, No. 4 Duke and No. 5 Wake Forest all remained in their positions for the third-straight regional poll. The Wolfpack, Paladins, Blue Devils and Deacons will all do battle at Pre-Nationals on October 13. The Hokies will meet the other three ACC schools in the top-five at the conference championships. There wasn’t much movement in the West Region as the top-eight teams did not race this past weekend. In fact there hasn’t been much movement at all in the region as the top-five teams have remained in their original rankings from the preseason poll. Stanford stayed in the No. 1 spot in the region while No. 2 Oregon and No. 3 Boise State round out the top-three. No. 4 Washington and No. 5 California are also in their same opening spots in the top-five. All five teams will run at Pre-Nationals on October 13.